I found that notebook not long after I read the news of Peaches Geldoff's death. I don't know a lot about her and haven't followed her life or career. But what I do know is that she left behind two very small boys. My heart breaks for those boys, when I think about them growing up without their mother. Life is such an unpredictable thing. It's easy to take it for granted, even though we know it can be taken from us in a second. Hearing the sad news of her passing, and of the shock death of another blogger's husband on the weekend, it reminded me once again of how precious this life really is. What I found when I opened that notebook was a letter I'd written to Zee, exactly one week before she was born. At the time I was really struggling with the prospect of being induced and just feeling so desperate to meet this baby I'd carried around for 40 weeks to the day. I remember writing a similar letter to Punky, 3 days before she was born. Punky's letter carries with it the expectation of motherhood. I talk a lot about how much I can't wait to meet her, the hopes and dreams I have for her, my hopes of being the perfect mum. I love that letter, and I know she will one day too. I love it because I can see myself standing on the precipice of motherhood, about to step off in to the unknown, having no idea what I was really getting myself in to. "Before your sister was born I was so incredibly nervous. I had no idea what to expect and I worried so much about being the perfect mother." What I didn't know before Punky was born was just how hard some aspects of motherhood would be. I also couldn't fully comprehend the joy and pure, unfettered love I would feel towards my child. It changed me, in a way no other event in my life has or could. 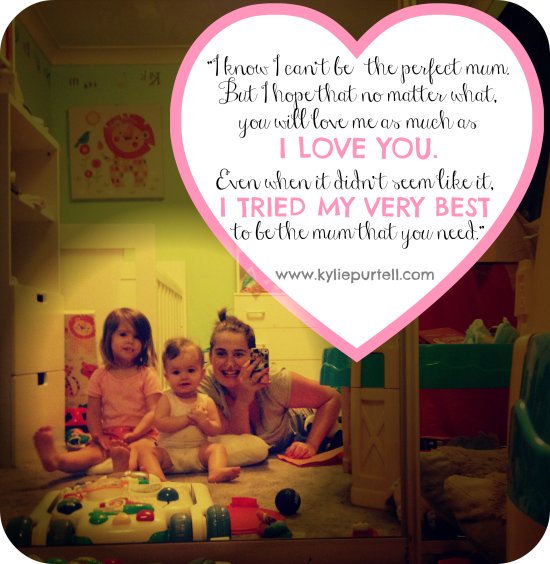 "I know I can't be the perfect mum. But I hope that no matter what, you will love me as much as I love you. Know that even when it didn't seem like it, I tried my very best to be the mum that you need." That sums up my journey of motherhood so far. If there is one thing I want my girls to know, especially as they get older, it's that. Everything I do for them, I do with love. All I can do is promise I'll try my best for them. That I do try my best for them. And that I loved them. Before they were born I loved them. And when I'm gone, I'll love them still. If I die tomorrow, that's what I want my girls to know. You're beautiful. The love you have for your girls is evident in every fibre of your being. I heard about this tragedy today. Just heartbreaking. I'm sure they will. You've been showing it every single day so I'm sure they know. A very lovely post my dear..
Love this Kylie. I want my kids to know that about me too. I'm certainly not perfect. So far from it. But I do try. I can try harder some days, but I do try. Lovely post Kylie - it is so good to have the written proof of how you have grown as a mother and person. And you words, written now, will endure, along with the love you have for your kids, no matter what happens in our unpredictable lives. It is scary to think that we might not be here tomorrow to tell our kids how much we love them. I used to write notes for them when they were younger. Thanks for the reminder, I will go back to writing more every now and then. Lovely post! Oh my, this made me cry. I feel EXACTLY the same about my two girls. I really do try my best and I will love them to the ends of the earth.